Bitrape, a bit rate and aspect ratio calculator. Download Bitrape from the official site. 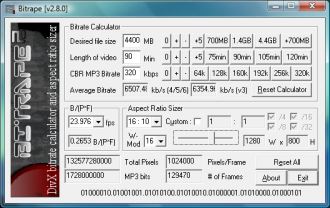 DivX bit rate calculator and aspect ratio sizer. Also runs in wine under Linux (last tested 0.9.54 + .56).